The Biodiversity Heritage Library (BHL) was formed in 2006 as a consortium of ten natural history, botanical garden, and university libraries with the purpose of digitizing key taxonomic literature in an open environment. The BHL members digitize public domain books and journals held within their collections. To acquire additional content and promote free access to information, the BHL has also obtained permission from publishers to digitize and make available significant biodiversity materials that are still under copyright. The BHL portal allows users to search the corpus by multiple access points, read the texts online, or download select pages or entire volumes as PDF files. Researchers can bring together publications of over 150 million species names and find links to related content in the Encyclopaedia of Life. Because of its commitment to open access, BHL provides a range of services and application programming interfaces which allow users to harvest source data files and reuse content for research purposes. Since 2009, the BHL has expanded globally to the current network of 40 participating institutions. BHL Africa, launched in April 2013, was the first global BHL partner that was formed directly under aegis of librarians and consists of an inclusive network of 13 African libraries and institutions in eastern, central and southern Africa. Our main objective is to develop the digitization skills of librarians, provide access to biodiversity literature, as well as repatriating African literature. In Africa, literature about the biota existing in developing countries is often not available within their own borders. 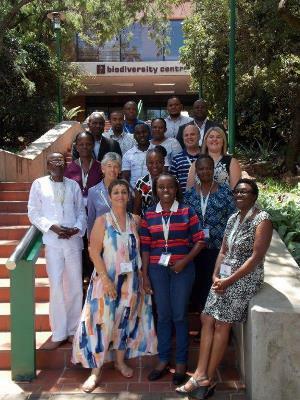 As the leading biodiversity institute in Africa, the South African National Biodiversity Institute (SANBI) Libraries drives the African group of affiliates to digitize biodiversity literature collections of exceptional value available only to those few who can gain direct access to these collections. BHL Africa members work with the taxonomic community, rights holders, and other interested parties to ensure that this biodiversity heritage is made available to a global audience through open access principles. Researchers have long considered that access to the published literature is one of the chief impediments to the efficiency of research in the field. Having access to BHL has had an enormous impact on the work done by SANBI researchers and has pulled the biodiversity community together. The instant accessibility to a wider collection of literature, that would otherwise be impossible to find, has made their work more productive. Furthermore, BHL has unlocked previously unknown information that contributes to the verification and correctness of data that researchers have to provide to their end users. For historical taxonomic purposes, this is essential as it provides them with an invaluable resource of information.